In attempts to understand the pathogenesis of primary myopathies in man, the study of experimental myopathies in warm-blooded animals is of fundamental interest. 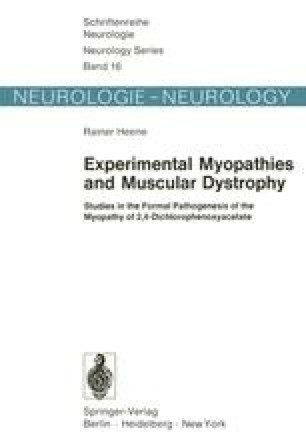 Among these, the hereditary myopathies of the mouse and of the chicken and the myopathy induced by vitamin-E deficiency are particularly important, as well as the myopathies that follow treatment with corticosteroids or chloroquine. Morphological and physiological studies of these model diseases in animals are essential, less with regard to the etiology than to the formal pathogenesis of muscle diseases. This means that the findings must be considered as relatively nonspecific. The specific etiology of the various primary myopathies in man and in animals involves problems of molecular biology, which at present are still largely unsolved. It thus falls within the scope of formal pathogenesis to trace the symptoms back as closely as possible to the hypothetical primary lesion. Such an attempt has been undertaken in the present study, which refers essentially to the earliest alterations in skeletal muscle, as detected by histochemical and histological methods.